It's Friday and time for the TFV's. 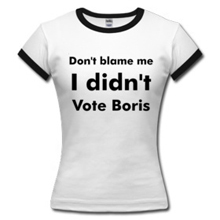 Back in London so it's the Tube Fashion Victims rather than my New York Subway Fashion Victims. If only I could have got Steve Coogan to guest post, I think that Pauline Calf "the most sophisticated dresser in Ottle" would have had fun. But you'll have to make do with me for a look at commuters on the London Underground, who've "taken a style and made it their own"! It's well and truly autumn and we virtually had no summer this year. 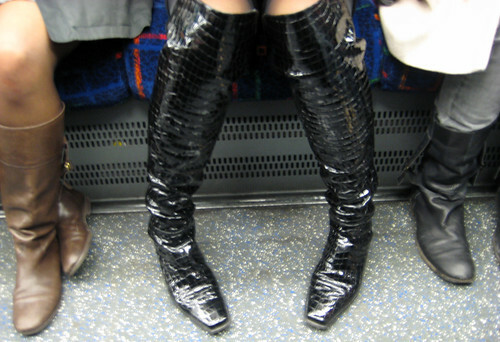 But with the autumnal nip in the air we'll see a lot of boots on the Tube. Last night I sat in front of a trio of ladies in boots. Clearly the woman in the middle stands out. Just look at the way she's holding her feet! This is what comes of wearing thigh high shiny patent boots with "F**k me" heels. Not the most practical footwear for the London Underground. Pauline Calf would have been proud of this look. You can't quite see the full glory of the leopard skin wedge heels on her shoes. Coupled with the just about the wrong length leggings and a err ... interesting Ra Ra Tiered skirt, I can't say I'm loving her look. It all starts to go a bit Pete Tong the further down you go. 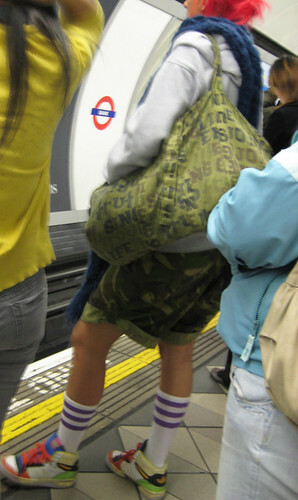 I'm not sure that camouflage and football player are two looks that go well together. And those dayglo Adidas trainers - they look a bit too box fresh for her to be sporty. But I could be wrong, she may have the rest of her training kit in her big bag or her "day wear" clothes. Until next time the previous fashion victim post is here and the complete picture gallery of all the TFV's can be seen on the following Flickr set.